We met at the VIMS boat basin at 8:30 am on a beautiful autumn morning. Several participants were seasoned veterans of the process and quickly got to work disassembling reef ball molds from a previous build. The group, along with other volunteers and CBF members, were anticipating delivery of concrete at 10am and we were ready – but the truck had issues. After much waiting for our concrete, the bucket brigade began. We finished early with many hands making light work and even had time to help with stuffing concrete by hand into the smaller “lego-style” reefs designed for homeowners. So what does CBF’s Virginia Oyster Restoration Manager, Jackie Shannon, think of YRSCB participation in this project? “We are so grateful for the support that the York River and Small Coastal Basin Roundtable has provided the Chesapeake Bay Foundation over the past four years. The funding and volunteerism that this group has provided has resulted in the construction of 100 oyster reef balls. I am pleased to say that we are working with other restoration partners to install the reef balls into the Piankatank River next spring (2017)! The Nature Conservancy (TNC) owns a significant amount of land in the Piankatank watershed – many acres that border the river directly. TNC contacted CBF about partnering on a project that would protect some stretches of their shoreline that are experiencing active erosion. Over the last several months, CBF has been in discussion with The Nature Conservancy, Old Dominion University, and the Virginia Institute of Marine Science to discuss the best way to develop a project that documents coastal resiliency. 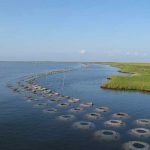 We agree that reef balls would be an ideal structure to protect the shoreline while also creating three dimensional habitat for oysters and other Bay species to utilize. See photos (courtesy of Pattie Bland, Karen Reay and Jim Tate) below and click on each photo to enlarge.